Mitigating risk posed by earthquakes, extreme weather events, and serious incidents like fire and gas leaks was at the forefront of Kiwibank’s decision to set up a strong regional office in Hastings in 2014. Then CEO Paul Brock said the Hastings office would supplement core banking services provided by Kiwibank’s Wellington head office. “We are now establishing a strong regional office that can cover an event that affects the two main offices,” he said. With the Hastings office’s third anniversary having just passed, that decision has already proven to be a masterstroke. The Kaikoura earthquake of November, 2016 rendered head office in Wellington uninhabitable for several weeks. During that time about 90 staff volunteered to relocate to Hastings to continue offering a full range of services. About 130 staff now work in what once used to be Farmers department store, on the corner of Market St and Queen St, 70 in the Contact Centre. Service Excellence Manager Mairin Gallagher says they started out with one team, but now have five – three dealing with customers on the phone, another by digital means, and one sales team. Upstairs the Enterprise Operations team deals with mortgage settlements, inter-bank settlements and the like, while out front is the retail sales team. Kiwibank’s staff are loyal, Marin says, with attrition “relatively low”. “People move on within the business mostly, although we naturally lose a few young ones. A lot of it is down to culture. Looking after your team is huge at Kiwibank. We’re continuing to build the culture we’ve got here, and the capability of the people. The Hastings office has already proven its worth in a crisis, there are employable people in the region, Kiwibank staff who have relocated have found Hawke’s Bay to be a desirable place to live and work, and commercial leases are cheaper than in the cities. 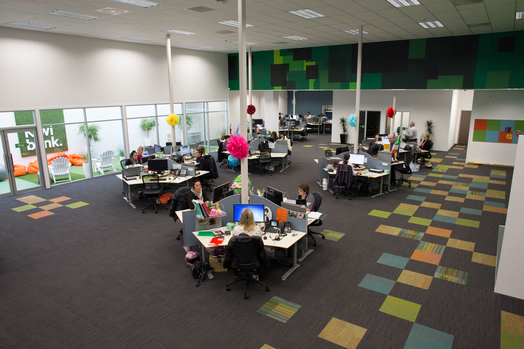 After three years Kiwibank’s regional office stands as an example to others that Hawke’s Bay has much to offer big business.